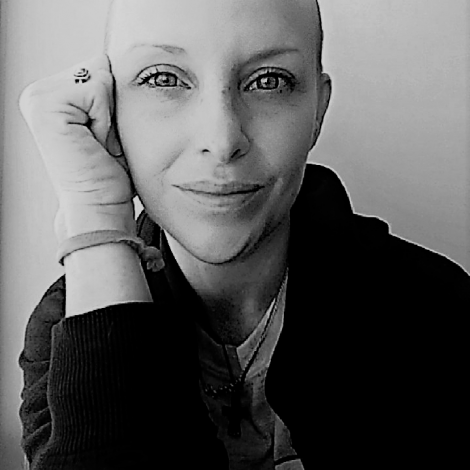 My name is Heather and I was diagnosed with acute myeloid leukemia (AML) +FLT3/ITD on December 14th, 2017. That morning I noticed I was extremely pale and I had large bruises over my body. My doctor ran blood work STAT and within an hour I knew my platelets were below 20 and I needed to rush to the ER. I was pretty near death at that time. I was in Disseminated Intravascular Coagulation (DIC), which has a pretty high mortality rate. I ended up having two strokes because my body started forming clots in the vertebral arteries that feed my brain. I also formed clots in both arms and in one of my hepatic veins that drain blood from liver into the heart. I had multiple infections including sepsis and fungal pneumonia. My amazing oncologists were too scared to give me any sense of hope of survival though that 1st round. Any time I was encouraged because I pulled though some catastrophic event, my doctors would only say "Let's see how tomorrow goes." The only option was to keep moving forward! I was in the ICU during my entire first round of induction chemotherapy but I successfully went into remission! Over the next four months I had three more rounds of consolidation chemotherapy along with a new FLT3 inhibitor called Rydapt. After that final round I began to prepare for an allogenic stem cell transplant. I had Total Body Irradiation and some legitimate chemotherapy before getting my stem cells on July 4, 2018. A beautiful unrelated donor from England donated her cells so I could have a chance to live. I want this life more than I can express. I have three amazing kids who I need to live for; Cole (17), Emma (9) and Chloe (5). I have a fantastic husband named David who is the love of my life. Who thinks I am beautiful even though I look emaciated and am bald. I have a strong supportive family who loves me beyond words. I need to live. I have so much I want to see and experience. I want to show my love for God, want to hold my kids for years to come and want to snuggle my husband at night until we are old and grey. I pray this is my path.